Welcome to the 491st Metamorphosis Monday! When I was vacationing in Maui last week, I was minding my own business walking down Front Street in the lovely town of Lahaina when a beautiful sun in a nearby shop window dazzled me with its shimmering beauty. It literally stopped me dead in my tracks. I’ve always loved sun motifs and this beautiful sun glimmered and sparkled in the Hawaiian sunlight. It was love at first sight! I stepped inside the shop and tried it on, then spent the next half hour trying to choose between it and its baby brother that was about half the size. I loved them both, so it’s was a really hard decision, but ultimately I went with the smaller sun. This little sun designed by Roberto Coin has a hidden secret. Roberto tucks a tiny ruby into every piece of jewelry he designs. It’s always placed in a spot where it touches the skin of the person wearing it. On my sun necklace, it’s on the back near the top. 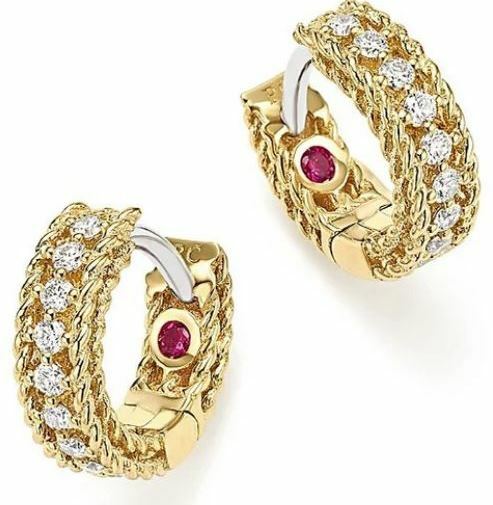 Here’s an example showing the ruby tucked into a pair of Roberto Coin earrings. Why does Roberto put a ruby in each piece he designs? The ruby has always been enveloped in a legendary aura, and due to its exceptional quality of maintaining beauty throughout time, it is considered eternal, like true love. According to an ancient belief, wearing a ruby close to the skin promoted long life, health and happiness and even today it is believed to possess these magic powers including the extraordinary ability of giving peace. In 1996, Roberto Coin started signing his jewels by setting a small ruby hidden on the inside of each piece, allowing the distinguished gem to kiss the skin. Since then, this tradition has become the exclusive signature of every jewel by Roberto Coin, dedicated as a secret gift of good wishes to every woman lucky enough to wear one of his exclusive creations. Though I went with the smaller sun, I’m still crazy about the larger one. I can’t really justify buying both, but if you could use a bit of sparkly sunshine in your life, the larger one is available here: Sun. It’s about twice the size of mine seen in the photo below. Fortunately, the sun necklace is designed where it can be worn at either of two lengths. I have it in the longest length in the photo below. I think Roberto designs most of his necklaces this way, where they can be worn at two different lengths. I know this isn’t the greatest photo but I wanted to share how I’m wearing my sun because it led me to a really awesome discovery. 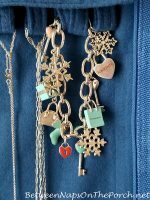 When I purchased this necklace, I was thrilled to see I could layer it with my Tiffany & Co. “Smile” necklace. I never take my Smile necklace off so it was important that I could wear both at the same time. The only issue I’ve run into with wearing both necklaces together is the same problem I’ve run into before when trying to wear two necklaces: the chains always end up rolling together and getting tangled. Around 5-6 times a day I have to untangle them, otherwise, they would become a tight mess by evening. Determined to solve this problem, I went in search of a solution and found something very cool–something called a necklace spacer! Based on the tracking, this little necklace spacer should be arriving today or tomorrow. I ordered it in silver, but it’s also available in gold and I think, rose gold, too. I ordered the spacer that works with two necklaces, but as you can see below they make them for layering three necklaces, too. 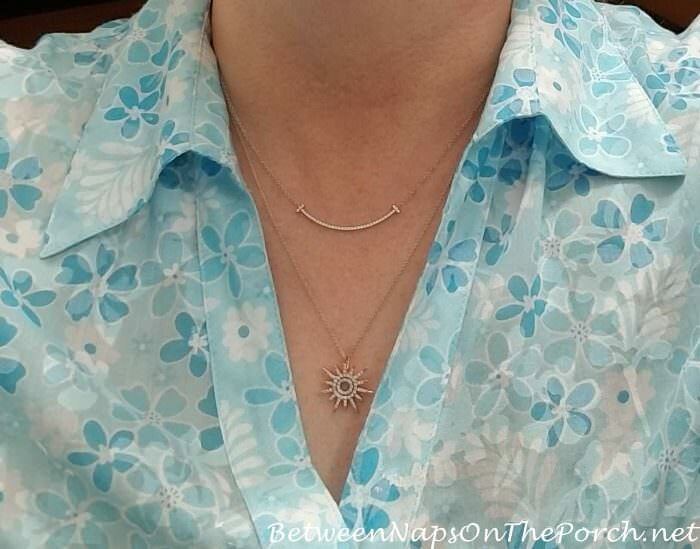 If you have a couple (or three) necklaces that you would love to wear together, you’ll find this necklace spacer available here: Necklace Spacer. I can’t wait for it to arrive so I can wear my necklaces without them rolling up and getting tangled together. So excited to get this! Another item I Googled for recently and was shocked to see that someone actually makes is a ring protector. I wear my favorite rings every day. Life is too short to not wear the things we love every single day! I do worry though because sometimes I’ll run out onto the decks and fill up the birdfeeders if I notice they are empty during the day. Or, I’ll stop and wash up a few dishes in the sink. In the reviews, people were saying they even wear them over their rings when gardening or doing yard work, although I think I’d take off my rings for that. 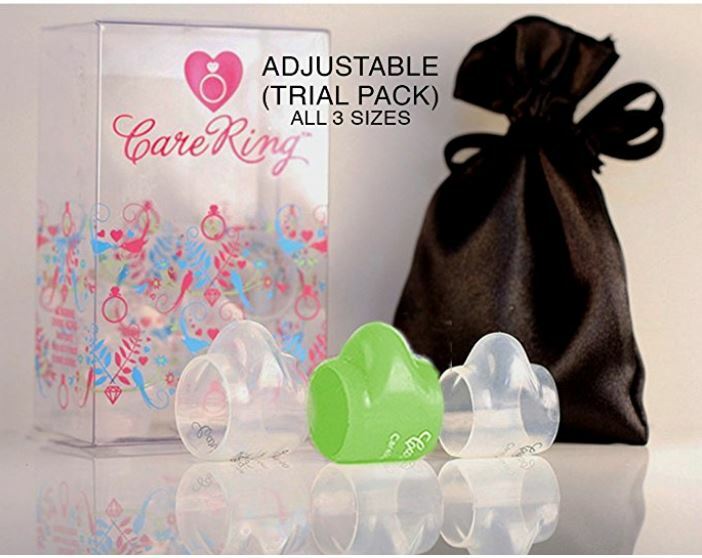 I ordered the “adjustable” trial pack that includes a ring protector in each of the three sizes they make, that way I can see which size will work best for my rings. I have a feeling I’ll be ordering more of these, love the idea of being able to protect my rings when I’m working around the house, especially one particular ring that I wear a lot that sticks up really high. You’ll find these ring protectors available here: Ring Protectors. So that’s my Met Monday for this week. Hope these solutions prove helpful if you’ve run into either of these issues in the past with your jewelry, too. Looking forward to all the great Before and Afters for this week’s Metamorphosis Monday! I post almost daily on Instagram. Follow Between Naps on the Porch on Instagram here: Between Naps On The Porch. If you enjoyed this post, subscribe for free email updates when a new post is up here: Subscribe for post updates. Metamorphosis Monday is a party that’s all about Before and Afters. If you are participating in Met Monday, please link up using the “permalink” to your MM post and not your general blog address. To get your permalink, click on your post name, then just copy and paste the address that shows up in the address bar at the top of your blog, into the “url” box for InLinkz. To those who are linking up: If you notice a shop or online store linking up to sell products (yes, unfortunately, that does happen) please let me know so I can remove their link and block them from participating in future parties. No one wants to click a link expecting a Before and After, only to find a spam link to an online business/store. Thank you for posting all the info about the necklaces and rings – well definitely be getting some of each! Your new necklace is beautiful. I have a couple of pieces of Roberto Coin jewelry I ❤️ Necklace spacer very clever! Let us know how well it works. Thanks. I am always clanging my rings on tables when I eat and my husband tells me to take them off. I will just usually turn them around. I, too, wear my good jewelry everyday. At 71 what would I be saving them for?! I love your sun pendant, so pretty. You find the most unusual things Susan! The necklace spacer looks really cool, and I especially like the way it looks if your hair is up, so pretty! Thanks for the party today and the suggestions! Love the ring protectors Susan! Thanks for hosting. Necklace spacer is a great idea. And your necklace is lovely, love the hidden ruby. Not sure why one would not just take off their rings. But I live in hot Houston and the idea of a tighly fitted piece of plastic over my ring sounds unpleasant. Ring protectors?? No way!! My wedding rings are vintage pieces from my grandmother. I almost never wear them since my hands always have the potential of being in some sort of ick…I am off to buy!! Thanks!! 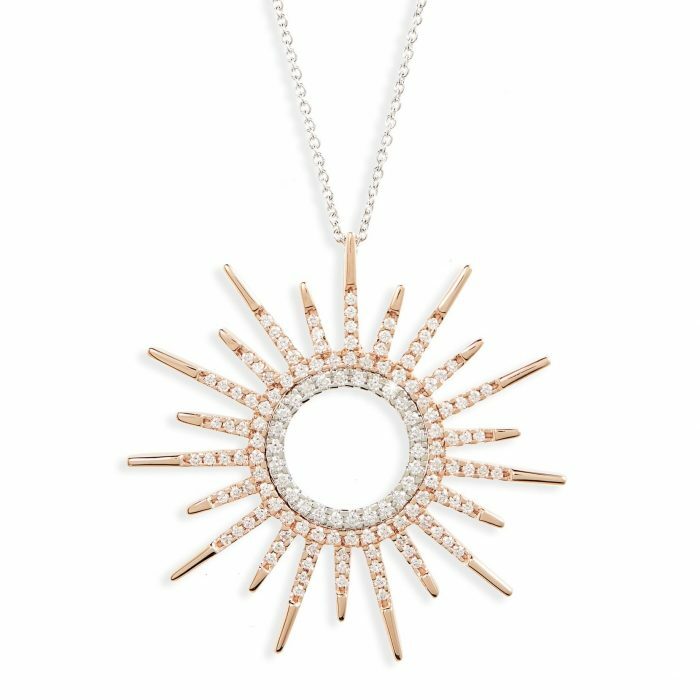 Oh that sun pendant–just so gorgeous. Hope you wear it often, especially in the depths of winter, it might have magical properties! Susan, you are so clever in finding items I would never dream of. This is one reason I love to read your blog. You talk about everyday “real” life. Genius jewelry items. Tangled necklaces drive me crazy. I don’t take my rings off either and worry about them. I love your new necklace. Thanks for hosting. It’s always a great party. Thanks for the tip on separating necklaces. Another problem that I have is that my shoulder length hair often gets tangled in the necklace clasp. Any ideas for preventing this from happening? That necklace spacer is a great idea! And I love your sun necklace, and the story behind the rubies. Cleo, when I get home I’ll look at my order and email the seller and ask her if she can add more to her Etsy shop. I think they are made when you order because when I ordered mine I got an email from her saying that it would take about a week for them to make it and then it took me about 5 days to get it after it was shipped. I love this new necklace (and all of the others) you got on your trip. Thank you for hosting! 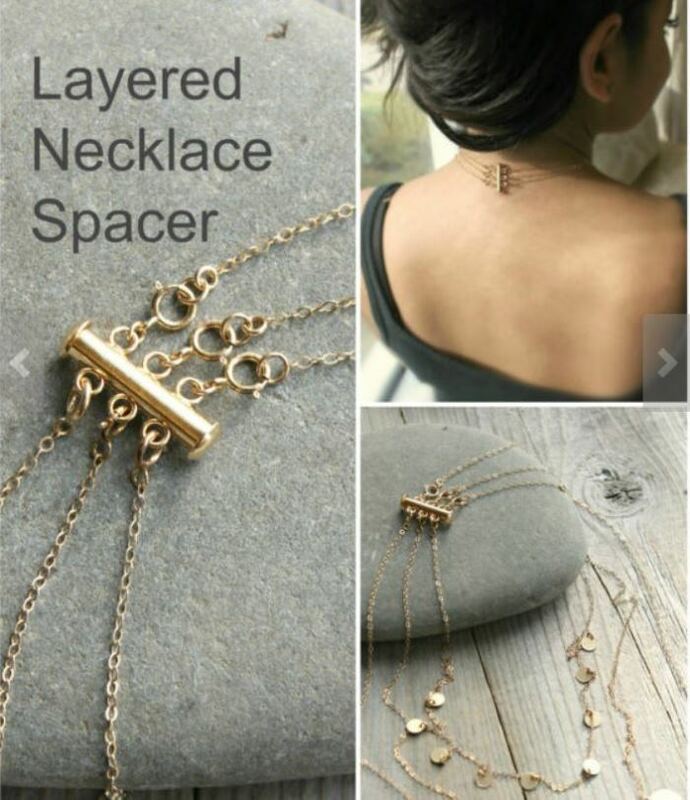 REALLY like the idea of the necklace spacer. Pinned. Let us know how the ring protector works out, if it pushes too hard on the ring into the finger , especially if the diamond or other gems sit up too high, or if it makes your finger sweat, etc. I never take off my wedding ring, only to clean it, but think I probably should when gardening, however I do water gloves all the time. Your sun necklace is lovely. Do you still wear your compass /travel necklace? Thanks, Cyndi! The spacer is working very well. I learned today that when I change clothes, I have to make sure I don’t flip it over. I did that today not paying attention. Very pleased with how it working so far. I’ll let you know how the ring protector thingy works…it is supposed to arrive tomorrow. Not sure how much I will use it, but looking forward to trying it. I forgot to take my necklace when I went to Germany trip, but I do still like to wear it when I travel. It’s getting trickier to wear now that I have the new necklaces that I like to wear full time. I wonder if I’m the only person who does that, get attached to a necklace(s) and not want to take it off. lol It certainly limits you buying anymore. Great ideas and your new necklace is beautiful. I am happy to be back participating in Metamorphosis Monday! I love the necklace spacer….I don’t know how you find the cutest things but you do…love all the jewelry. P.S. : Do love your sunburst pendant and the hidden ruby makes it extra special. 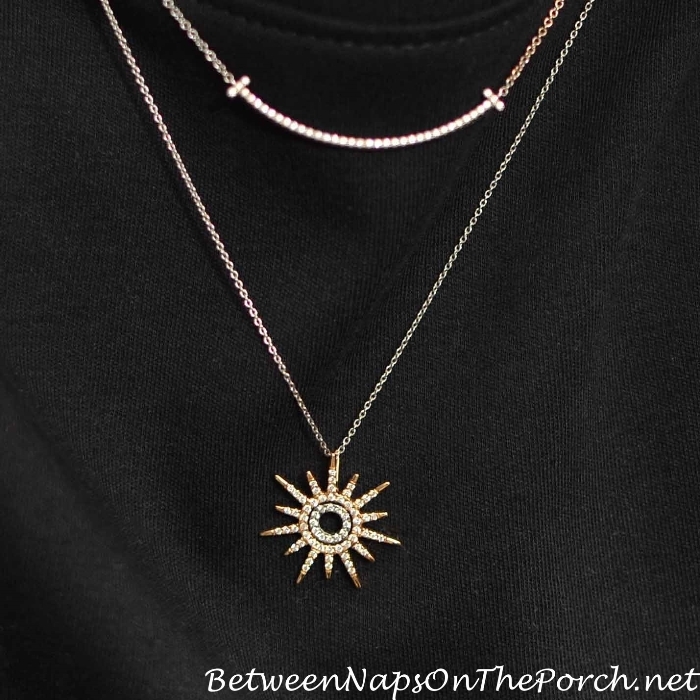 Love the Sunburst necklace but wow, what a price. I am going on holiday to Italy in October , I will look and see if they have them cheaper there or at the airport before we come home. I love the story of the ruby. Jackie, look for the smaller one like I have. I love the bigger one that I linked to in the post, though…it’s stunning. The reason for the cost is all the diamonds, and of course because it’s 18K gold. 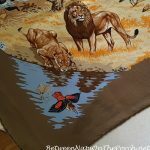 It’s a quality, gorgeous piece!